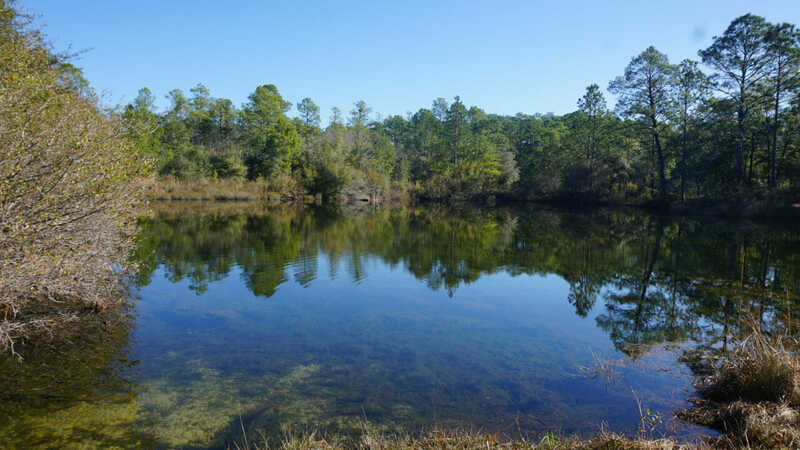 Florida Trail, Eglin | Titi | Florida Hikes! 14.8 miles. 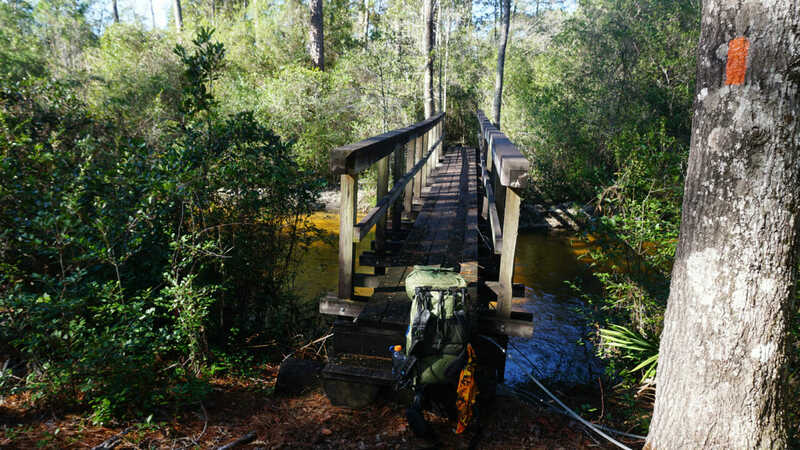 Paralleling the floodplain of Titi Creek and its tributaries, this 14.8-mile hike on the Florida Trail on the Titi section across Eglin will surprise you with its mature longleaf pine forests and steep descents into creek basins. Traversing the central uplands and creek basins of what was once Choctawhatchee National Forest, this lengthy day hike – or overnight backpacking trip – is a pleasant immersion in mature forests mostly distant from road noise (unlike the adjoining Catface section, which is scenic but noisy). Titi Creek and its many tributaries define the relief in these clayhills, providing diversions from higher ground as you follow boardwalks through their floodplains and take a break on their bridges. Near the halfway point, JR Walton Recreation Area provides the opportunity to break this hike into an overnight backpacking trip. All hikers must have a permit in advance of arriving at Eglin Air Force Base. Eglin now has a FREE permit for thru-hikers. Day hikers and section hikers not continuing at least 50 miles beyond Eglin must obtain the standard $20 annual Outdoor Recreation permit. Obtain your permit online. Eglin is an active military installation with ongoing training maneuvers. Aircraft may fly very low over the tree canopy and you may hear bombing. Stay in the trail corridor and use established campsites. If you notice any sort of ordinance – rocket, bomb, hand grenade – do not approach it but note the location and call Eglin Security Forces at 850-882-2502 to report it. For the eastern access to this segment, from the interchange of SR 285 with Interstate 10, drive south on SR 285 for 2 miles to reach the Old SR 285 trailhead [30.714701, -86.376221] on the right. The approach to it is a little rough, and you’re essentially parking off road near the kiosk. For the Pearl trailhead [30.687201, -86.571892] at the west end of this segment, take Interstate 10 to the SR 85 exit in Crestview. Drive south 3.1 miles, past all the hotels, and cross the bridges over the Shoal River. Get in the left lane. You’ll see a large FNST sign next to the road. Turn left at the turnout for Col. Greg Malloy Rd but make a U-turn instead to get in the northbound lanes of SR 85. A quarter mile north, look on the right for the unpaved entrance to the Pearl trailhead, which is down a short dirt road that parallels the highway. Heading north from Old SR 285, the trail immediately immerses you in the clayhills that Eglin Air Force Base is known for. Deep, rich reds stain the earth beneath the pines. Not far past RR 207 is the side trail to Speck Pond Recreation Area, which sits along SR 285 and is popular with car campers. 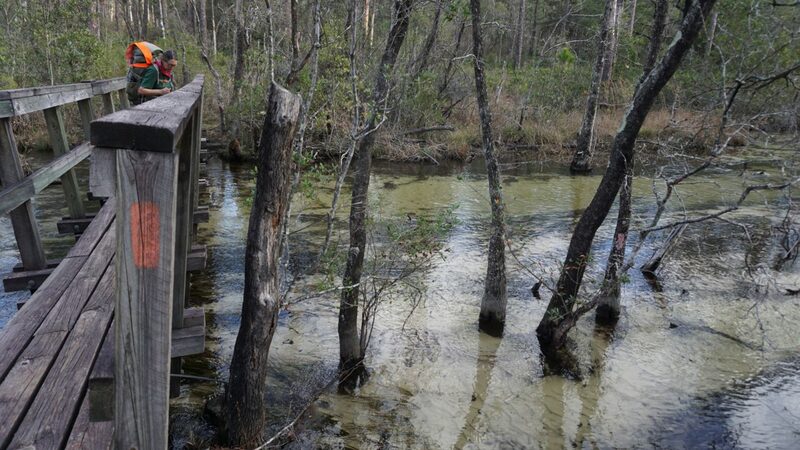 Dropping into the Gum Creek floodplain, the trail follows a series of bog bridges. Another descent brings you to Dog Creek, a better stop for filtering water. Big Fork Creek is a highlight of this hike after 5 miles, with a large sturdy bridge and stairs to sit on. Descending from this point down to the Titi Creek floodplain, the trail joins RR 220 to access JR Walton Pond, the first campsite along the route. This camping area is also shared by vehicles. There are nice views across the pond. Dropping through more clayhills and stream drainages, you cross Honey Creek and Silver Creek before encountering a paved road, Colonel Greg Malloy Road, where there are some benches. Two more creek crossings are ahead, bridged by puncheons, before you reach Pearl Campsite, the only backpackers-only camp along this segment. Pretty Pearl Creek is a quarter mile past the campsite. The trail continues to descend and can be quite soggy at times before it emerges at the Pearl trailhead.